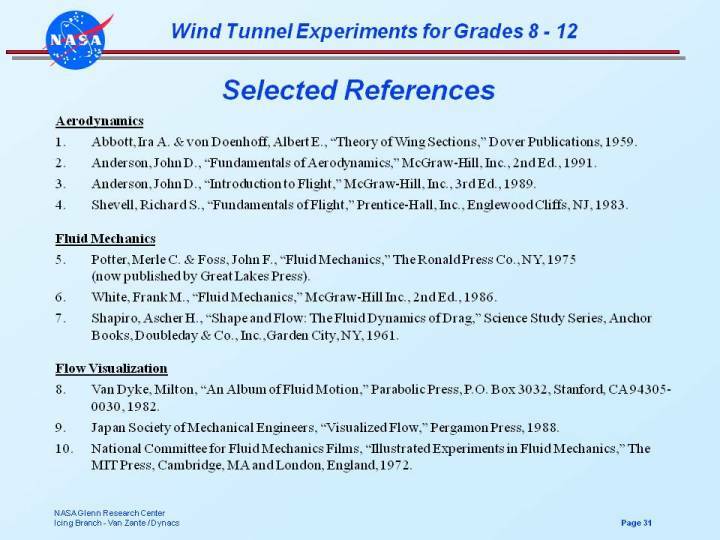 This is a list of references from Dr. Judy Van Zante's 1999 Power Point Presentation on wind tunnel experiments. 1. Abbott, Ira A. & von Doenhoff, Albert E., �Theory of Wing Sections,� Dover Publications, 1959. 2. Anderson, John D., �Fundamentals of Aerodynamics,� McGraw-Hill, Inc., 2nd Ed., 1991. 3. Anderson, John D., �Introduction to Flight,� McGraw-Hill, Inc., 3rd Ed., 1989. 4. Shevell, Richard S., �Fundamentals of Flight,� Prentice-Hall, Inc., Englewood Cliffs, NJ, 1983. 5. Potter, Merle C. & Foss, John F., �Fluid Mechanics,� The Ronald Press Co., NY, 1975 (now published by Great Lakes Press). 6. Shapiro, Ascher H., �Shape and Flow: The Fluid Dynamics of Drag,� Science Study Series, Anchor Books, Doubleday & Co., Inc.,Garden City, NY, 1961. 7. White, Frank M., �Fluid Mechanics,� McGraw-Hill Inc., 2nd Ed., 1986. 8. Van Dyke, Milton, �An Album of Fluid Motion,� Parabolic Press, P.O. Box 3032, Stanford, CA 94305-0030, 1982. 9. Japan Society of Mechanical Engineers, �Visualized Flow,� Pergamon Press, 1988. 10. National Committee for Fluid Mechanics Films, �Illustrated Experiments in Fluid Mechanics,� The MIT Press, Cambridge, MA and London, England, 1972.